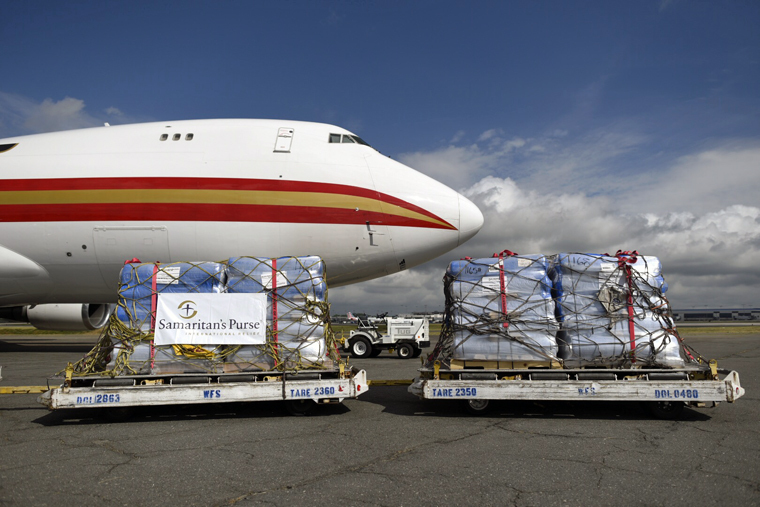 A jumbo jet chartered by Samaritan’s Purse departed Charlotte International Airport today packed with 8 million square feet of tarpaulin bound for Nepal. The cargo of rugged, UV-resistant blue plastic will provide shelter to over 20,000 households devastated by earthquakes in the Himalayan country. The imminent onset of monsoon rains threatens the health and safety of millions of people in Nepal. Samaritan’s Purse is already there delivering shelter and blankets to families who have lost nearly everything. The additional tarpaulin loaded on the 747 will help us reach our goal of bringing shelter to a total of 50,000 households. “Samaritan’s Purse has established a priority of shelter and blankets to keep people dry and warm,” said Ken Isaacs, Vice President of Programs and Government Relations for Samaritan’s Purse. The rugged plastic will help provide shelter from the elements for more than 20,000 households. Isaacs just returned from Nepal, where Samaritan’s Purse has been working since the initial devastating earthquake hit on April 25. He said the shelter material will be arriving at a crucial time. The 105 metric tons of relief packed today is the eighth charter Samaritan’s Purse has sent to Nepal, and the first from the U.S. The cargo jet will travel from Charlotte to Delhi, India. Materials then will be transferred to two chartered A330 cargo planes and flown to Kathmandu, Nepal’s recovering capital city. From there, our team will transport and distribute the plastic to mountain villages. Our disaster response team is now primarily focused on those living in remote regions of the country. Some of these areas are unreachable by road. Logistics have been challenging throughout our relief efforts in Nepal so far, but our team remains undaunted—relying on the assistance of U.S. Marine helicopters in some cases. 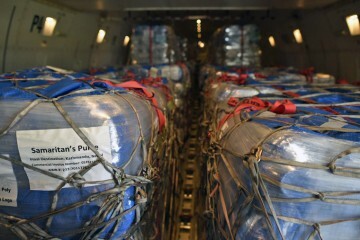 Shelter material from the airlift will be given to earthquake victims living in remote regions of Nepal. Thanks to generous support and prayer, Samaritan’s Purse has already provided emergency relief—food, medical treatment, kitchen kits, water, and more—to thousands. Samaritan’s Purse had disaster response personnel on the ground within 24 hours following the initial catastrophic quake on April 25. More than 8,000 people have died in Nepal, with over 16,000 injured, since the first temblor hit.